Late Filing Fees and Failure to File notices by the Wayne Count Clerk have been leveled against candidate Nofila Haidar who failed in seeking the Dearborn City Clerk position in November 2017 elections. In recent weeks and as we drew closer to Election Day, the word “corruption” was and continues to be thrown around and leveled at organizations by members of the community. More specifically, a local candidate has repeatedly accused AAPAC of being corrupt. The dictionary defines corrupt as “guilty of dishonest practices, as bribery; lacking integrity; crooked.” The law defines it more specific, but since we aren’t all lawyers, we will focus on the common definition. First we’ll start with AAPAC, since this organization has taken the most unfounded attacks recently. The Arab American Political Action Committee (AAPAC) was formed 20 years ago by members of the Arab American community in Dearborn who were frustrated with the state of politics in Dearborn. Because they wanted to change the political landscape, they formed a “political” committee. This may seem obvious, but there are legal reasons for the organization to be formed in this manner. Political action committees are regulated by the government and have very strict rules regarding raising funds and supporting candidates. In the 20 years of its existence, AAPAC has maintained full status as an independent PAC and has filed every required financial statement completely and on time. Records are meticulously kept and available online to anyone wishing to review them. AAPAC has never tried to skirt the law or hide its donors by filing late or incomplete documents. Everything is accounted for, including all flyers published, candidate contributions and each penny received. The reason AAPAC has maintained its status in the community for so long is because of the integrity of its members and the high ethical standards they hold. In 2014, a new PAC was formed in Dearborn. We will not even get into the ethical question of why someone would choose a name so similar to one that has been in existence for 20 years and maintains a solid reputation. It brings to mind the old adage “imitation is the sincerest form of flattery.” As with AAPAC, this new PAC is required to file the same financial disclosure documents listing all incoming contributions and expenditures. Unfortunately, no one can verify who actually funds this PAC because AMPAC doesn’t file those required statements. In fact, it claims a waiver, which means it doesn’t intend to receive or spend more than a $1,000. In the three years it has existed, AMPAC claims it has not received or spent the minimum amount required to file Campaign Finance Statements. While the law may not require this (if AMPAC is truthful about operating with under $1,000), integrity of the organization should compel the organization to do so and let the public know who AMPAC is, who finances it, and what it spends its money on. This transparency is overdue especially when AMPAC members are out in the community making unfounded accusations about others. Another big proponent of bad mouthing AAPAC is Nofila Haidar. She ran unsuccessfully in the general election for city clerk. Like the PACs described previously, all candidates are required to file similar campaign statements. 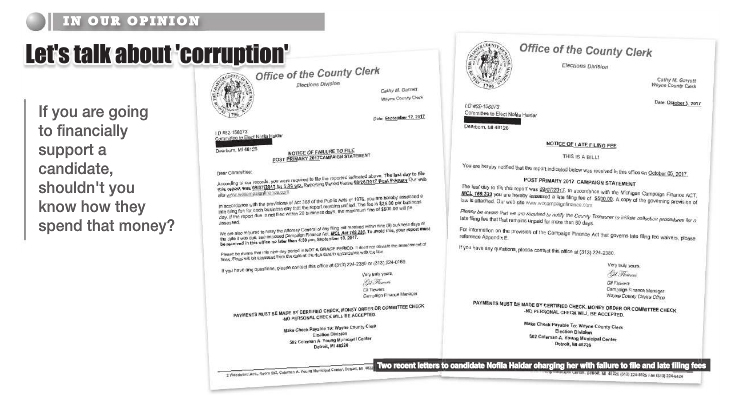 In local elections, the county clerk is the person charged with maintaining election records. It may seem obvious that someone running for city clerk (not to mention the number of offices she has run for so far) would be familiar with this process. A review of her filed financial statements shows that, so far, she has been fined $1,000 for not completing her statements on time. Not only this, but she also claims to have not received one dime since the primary election, despite having several fundraising events. Maybe this was her clever way to not rack up more fines while continuing to skirt the law with her lack of record keeping. Maybe she learned this trick from her political mentor and new husband, Hussein Berry. Over the years, Berry has racked up several thousand dollars worth of fines for not filing proper campaign finance statements. Either way, this is dishonest at best, but something that certainly the community doesn’t need in a position of public trust. There are so many questions regarding Haidar’s statements, like why does she owe $1,500 to Byblos Banquet Center when her committee shows a $2,000 balance. Perhaps instead of spending her time bad mouthing respectable organizations, she should spend it working on her campaign statements and paying her bills. 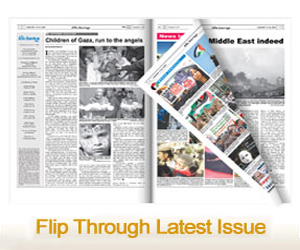 So, we’ve covered corruption, integrity and dishonesty. This brings us to accountability. Unfortunately, in today’s political space, facts seem to be irrelevant. The only way to change this is for the public to hold candidates and committees accountable. Political rhetoric only goes so far. If you are going to talk the talk then you better have facts and evidence to back it up. The public needs to stand up and demand accountability. For those who want change, true change only happens when everyone is held to the same standards and accountability is the tool to make that happen. If you are going to financially support a candidate, shouldn’t you know how they spend that money? Campaign statements give citizens insight into the integrity and honesty of candidates. Maybe we should pay more attention to them.